Residential MLS® Sales in the Fraser Valley are expected to trend lower in 2017 after a record year in 2016. In Table 1, MLS® sales will range from 19,500 to 20,200 in 2017 and slightly move up in 2018 to between 20,000 and 20,710. 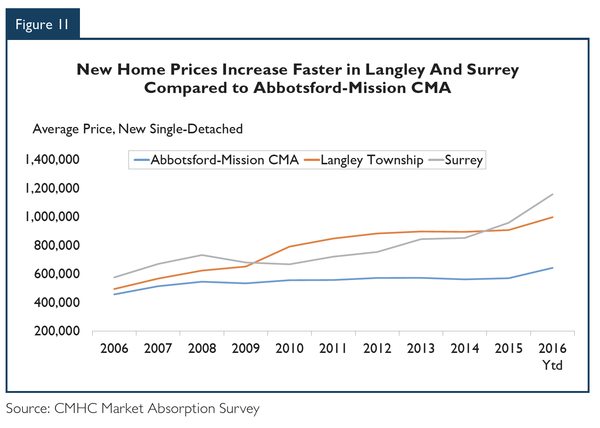 Though resales are expected to be lower than 2016 levels in the forecast period, total MLS® sales will range higher than the 10 year range in the Fraser Valley. Similar to other real estate markets in the Lower Mainland, strong seller’s conditions have pushed up prices to record levels in the Fraser Valley. The average price for 2016 is expected to be in the range of $641,500 to $706,900, well above the $577,507 recorded in 2016. Prices will slow down over the next two years as inventories of new and existing homes trend upwards, giving buyers more choice and time in their home buying decision. Also, MLS® sales of multiple-family homes, in particular apartment condominiums, will pick up as these units are more affordable to both first-time buyers and people looking for a rental investment. A number of variables are expected to support the resale market in the Fraser Valley through the forecast period. Economic fundamentals, such as job growth and low mortgage rates, will support demand, while population growth, especially among people between the ages 25 to 44, is expected to grow by 2.3 per cent, slightly higher 17 MLS® residential sales in the Fraser Valley Real Estate Board ranged from 12,588 to 20,055. 18 Though not tracked through CMHC’s Condominium Vacancy Survey (CVS), there are a number of people that purchase apartment condominiums and rent them on a monthly basis. Fraser Valley MLS® Sales to Normalize after Record Year Residential MLS® Sales in the Fraser Valley are expected to trend lower in 2017 after a record year in 2016. In Table 1, MLS® sales will range from 19,500 to 20,200 in 2017 and slightly move up in 2018. Housing demand will be supported by population and household growth. Employment opportunities in the CMA and surrounding centres, such as Chilliwack and Langley, will be a factor that attracts people to the region. Two primary groups of buyers and renters, people between the ages of 25 and 44 and above the age of 60, are expected to grow a combined 2.8 per cent annually. These two groups will comprise almost half the population in the Abbotsford-Mission CMA by 2018. Population growth will increase the number of households. The number of households is projected to grow from 66,248 in 2016 to 68,040 in 2018.